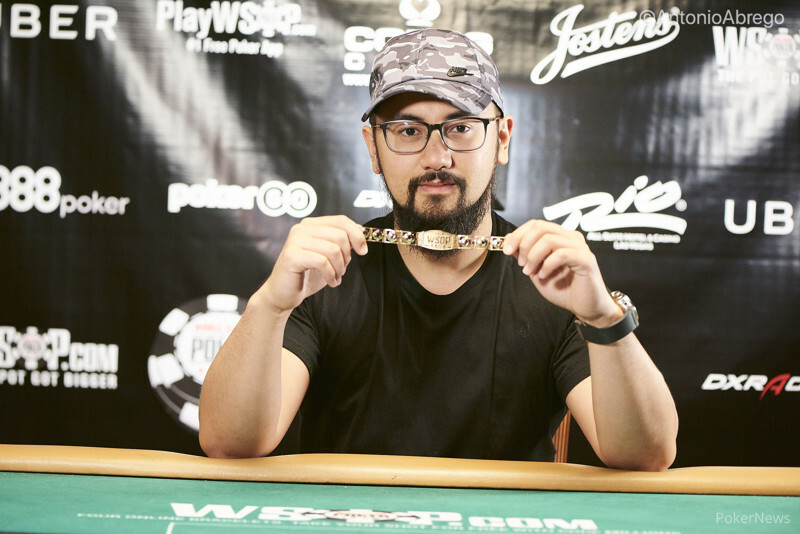 After nearly 16 hours on the virtual felt, Ryan 'Toosick' Tosoc defeated Anthony 'Flawlessbink' Maio to win his first World Series of Poker gold bracelet in Event #61: $1,000 WSOP.com ONLINE No-Limit Hold'em Championship and a top prize of $283,778. The WSOP.com Online No-Limit Hold'em Championship drew in a total of 1,635 entries gathered from 1,180 unique players and 455 re-entries. A prize pool worth $1,553,250 was created with the top 180 players walking away with a prize. Hand-for-hand play on the bubble began in the twenty-first level of the day, around 11 p.m. local time. Play was halted two away from the money and just a few hands in, two players were eliminated on the same hand. 'Feeltheflow' busted in 181st place, the official bubble, and 'Poker5050' finished in 182nd place. Within moments, over 60 players were claimed by the post-bubble bust-out bonanza. The only confirmed notable in the field, Shawn 'fortnite' Deeb, who was multi-tabling the $10,000 PLO 8/Better at the Rio, and was once a top-ten stack in the online event. He saw his run come to an end in 95th place banking $2,640. The final table was reached a little over 12 hours into play with the elimination of Bradley 'pokergrandpa' Snider by Maio. Snider shoved ace-four preflop but found himself dominated by the ace-queen of Maio and no help came. The pot gave Maio the chip lead into the final table with a significant advantage over the rest of the finalists. Two brutal rivers sent the next two players to the rail. Firstly, Aditya 'pokerpop76' Sushant got it in with pocket kings against James '5.56cal.' Robinson's pocket sevens. A seven on the river crushed those hopes and a couple hands later Aurelian 'Winamax' Guiglini was all in against Tosoc having him dominated with ten-nine to ten-eight. After both flopped their bottom pair, an eight peeled off on the river and the field was down to seven. The shortest stack at the table, Russell 'AntonChigurh' Powers, was the seventh-place finisher. Powers was down to just four big blinds when he shoved from the button with queen-eight clubs. Maio put him at risk and made trips with king-six. Markus 'thegreatrise' Gonsalves thought he flopped the world when he shoved ace-four into Robinson's ace-seven and found a four. It was short lived as a seven followed directly behind it on the turn. The very next hand, Justin 'lappypoker' Lapka shoved with pocket jacks and was eliminated when Tosoc called with an ace and flopped top pair. Robinson's run would end soon after. A three-bet shove from the small blind was snapped off by Tosoc and king-six was unable to beat ace-queen. 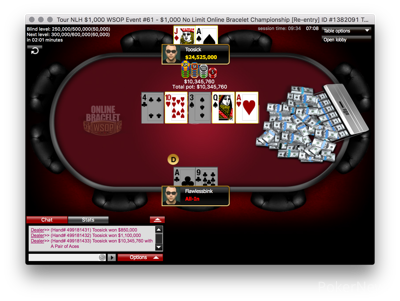 Tosoc would make the event heads-up just moments after taking out Joel 'AjaWilson22' Feldman with king-ten flopping top pair to beat pocket sevens. That pot gave Tosoc a slight chip lead to start heads-up play. Maio was able to grab the lead for a moment but Tosoc quickly got it back and began to pull away. A huge double up for Maio turned the tide once again. From there, with the stacks becoming increasingly shallow, the two players traded double ups back-and-forth exchanging the lead multiple times. Finally, Tosoc got the double up he needed to retake the lead and soon after the final hand was dealt. Maio open-shoved for just over ten big blinds with ace-nine and ran into Tosoc's ace-jack. A clean board for Tosoc gave him all the chips and the bracelet was his. Anthony 'Flawlessbink' Maio moved all in preflop with his last ten or so big blinds and found himself at risk and dominated by Ryan 'Toosick' Tosoc. The board ran out and Maio's torch was snuffed just one short of the glory, busting in second place for $175,206. 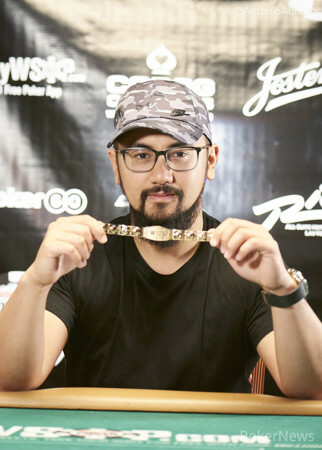 Tosoc wins the gold bracelet and a top prize worth $283,778. All the chips went in the middle on a flop with Ryan 'Toosick' Tosoc having the against Anthony 'Flawlessbink' Maio's . The board ran out and Tosoc faded a flush draw to double up and retake the lead. 'Toosick' open-jammed for 4,800,000 and 'Flawlessbink' made the call. 'Flawlessbink' was in great shape to claim the title but the board had other ideas running out , giving 'Toosick' a pair and the double up.